One of the most treasured possessions of the Otago Golf Club is a collection of clubs and balls used by our forefathers. 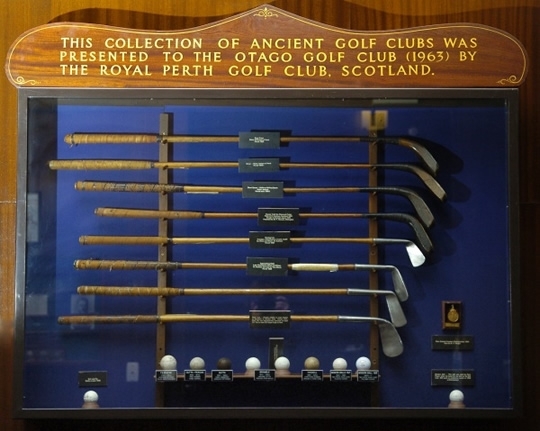 The collection is displayed in a showcase, which was donated by the Perth Golf Club of Scotland. The collection consists of golf balls, old and new, each of which has the Balmacewen Course etched deeply in its own particular history. On the left can be seen the "feathery" ball driven off by the Club Captain, Dr W Brown, as part of the official opening of the current course. The balls in the centre are gutta-percha golf balls. All were used on the course. The ball on the right is the actual ball used by Gary Player when he holed in one at the 283-metres 8th hole during an exhibition match in 1958. Most well-known of the clubs on display is probably the George Todd Memorial putter, a wooden putter that was Scottish-made in 1820 or thereabouts. It was brought to Dunedin about 1870. It is believed to be the very putter used by 83-year-old George Todd to sink the putt which gave him and his partner a win over Dr Brown and Lord Glasgow in a short round after the official opening of the course. All clubs in the cabinet originated from the old school of Scottish clubmakers. They range from driving irons and wooden drivers to approaching-cleeks and putters. They range in age from 1741 to the middle 1800s and their condition bears witness to the loving care that went into their manufacture.